I love meat and i love them BBQed. When i was holidaying in Korea 2 years back, the frequency at which i wanted to eat Galbi was driving S nuts (he thinks it's too oily). 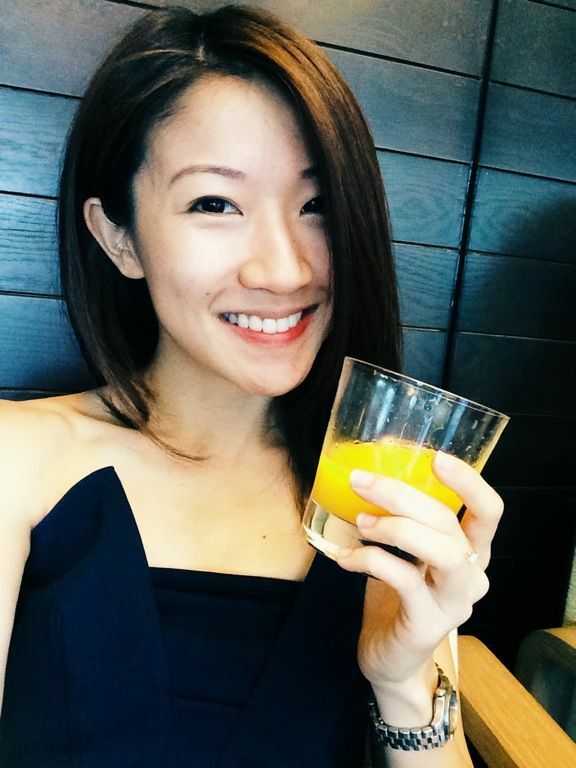 I don't even get to eat much of that in Singapore. BOO. So imagine the excitment when i was invited to Bornga at The Star Vista. 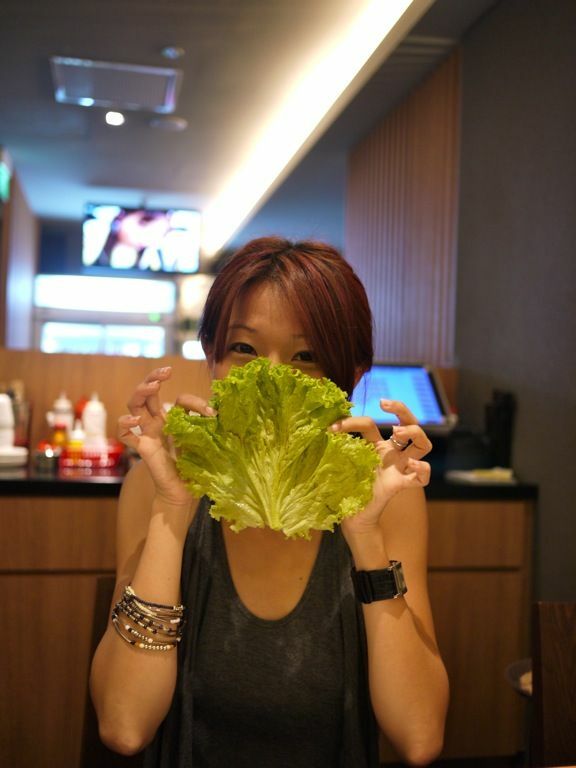 Now pile me with the Woo Samgyup till i go into a meat coma! 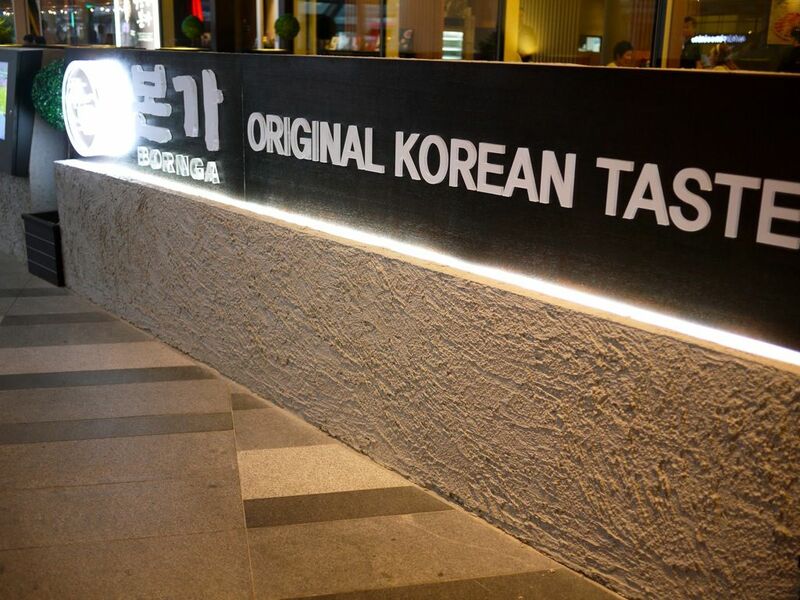 A little more on Bornga- it is the brainchild of Jong Won Paik, one of Korea’s most successful and renowned celebrity chefs. 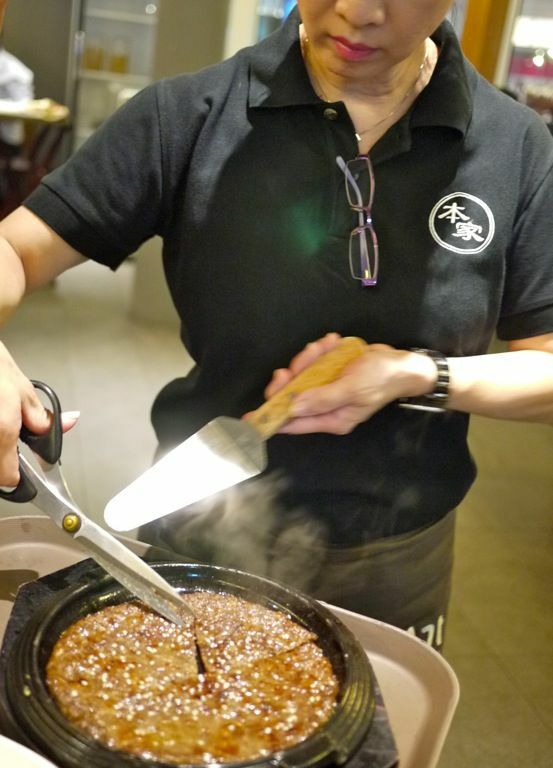 Since 2002, it has grown steadily into a BBQ chain that is popular not only in Kimchi land but also in China, US and Indonesia. How did Bornga win so many hearts? Well.. read on. 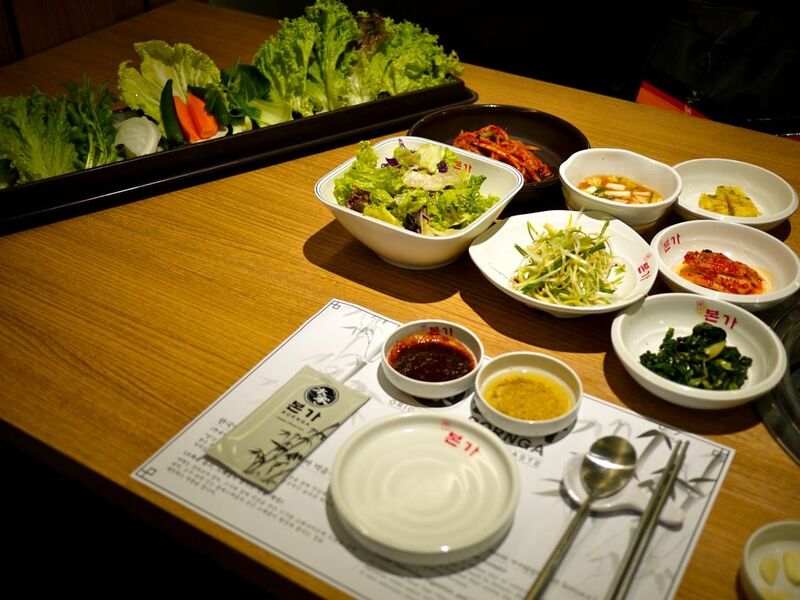 With the start of each meal at Bornga, or any decent Korean restaurant, diners would be greeted with a slew of Banchan (small plates). The dishes vary from day to day, and each restaurant would have their own signatures. These are refillable too. My favorites are the marinated spinach, anchovies, potato salad and omelette. Bornga serves 3 types of kimchi- the regular, water kimchi and radish kimchi. Each has its own unique flavor and they are all made in house. I quite enjoyed the light sweetness in the refreshing shredded radish kimchi. The looooong tray of raw vegetables on the left is served, to diners on the patented design tray, with any BBQ meat order. 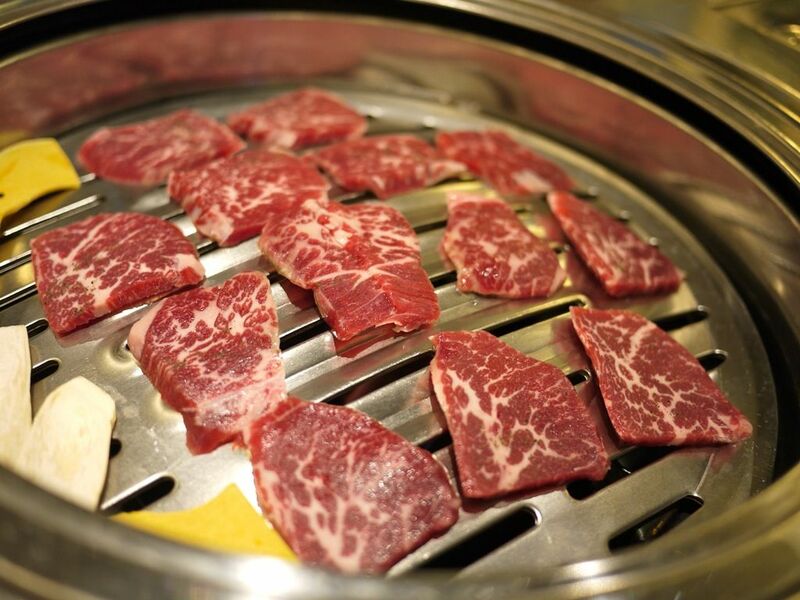 Many Korean BBQ serves Bulgogi, which is a sweet marinated meat (pork or beef typically). I'm not a huge fan of the high sugar content of this dark colored marinate. Bornga suits my taste because they offer Ggot Sal, an unmarinated prime cut Australian beef boneless ribs ($38). 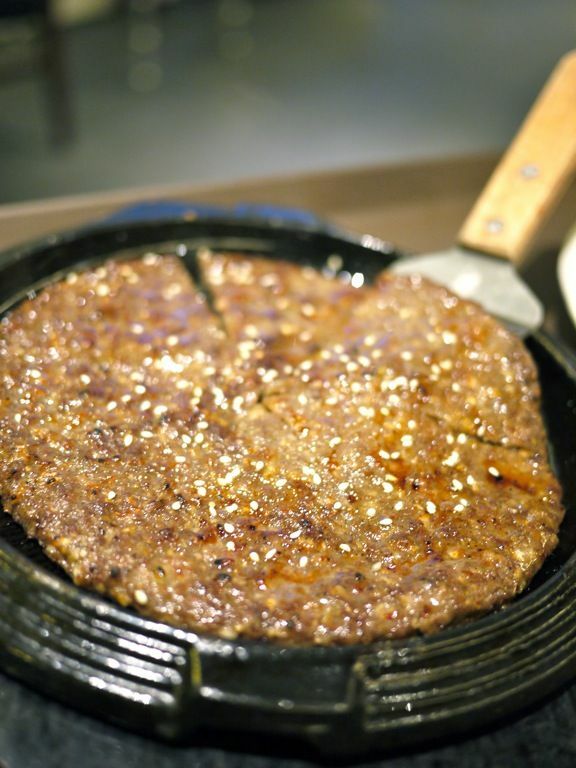 Saeng Galbi, another tender prime cut beef is also served without all that seasoning. This allows the natural flavors of the meat to be enjoyed. Eat it simply, or add some sesame and pepper seasoning and then stuff the entire veg-beef parcel into your welcoming mouth. If you prefer a little more flavor, go for the signature Woo Samgyup, a thinly sliced US beef shortplate with Bornga's special sauce ($22). This recipe is patented by Chef Paik and no one knows what's in it. The sauce is flown in from Korea regularly and the recipe secretly guarded. We only know that there are fruits in it. The sauce is only poured on the meat shortly before serving to maintain the meat's natural color. 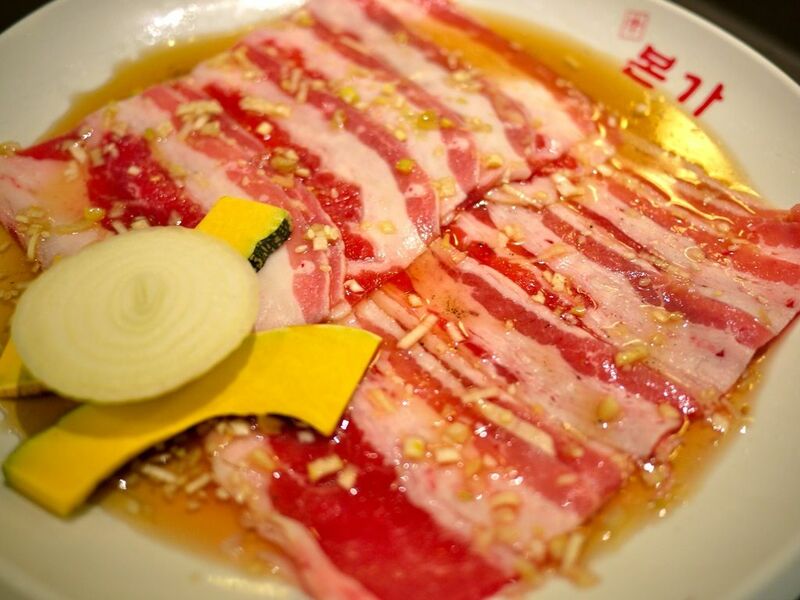 Due to the thin slices, the meat absorbs the flavors very quickly. I like that the mild sweetness, which is unlike the typical cloying bulgogi. Here's sharing the Bornga way of eating the Woo Samgyup. 1. Put the scallions onto the grilled meat 2. Roll them up in the meat 3. Dip into the patented Woo Samgyup sauce (top left) 4. Wrap the parcel up in the lettuce 4. Open your dinosaur mouth and EAT. 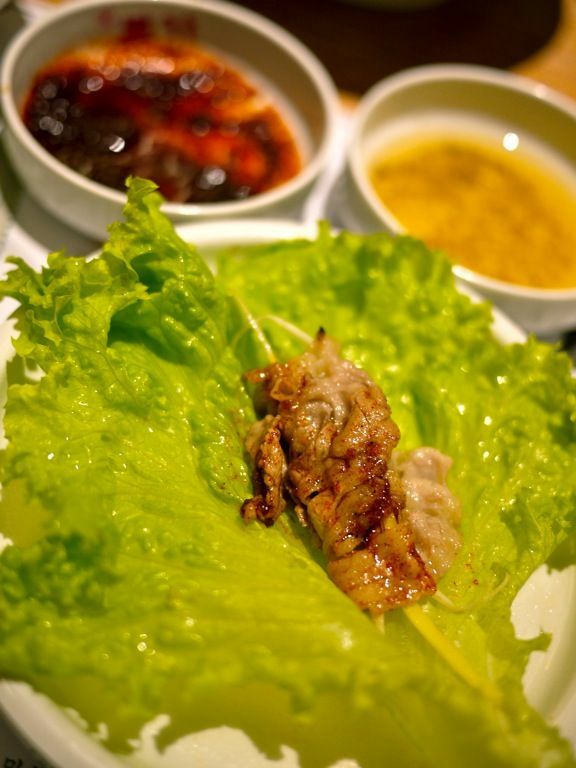 The scallions lift the taste of the meat and thus there isn't any heaviness even after eating a lot of meat packages. Heh. 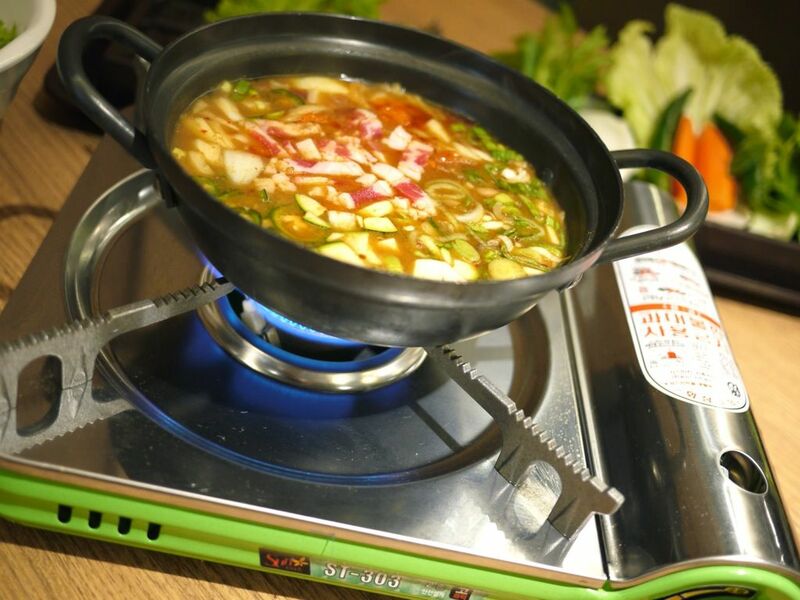 For those who can't do without their carbs, the Chadol Duenjang Jjigae is a signature dish. 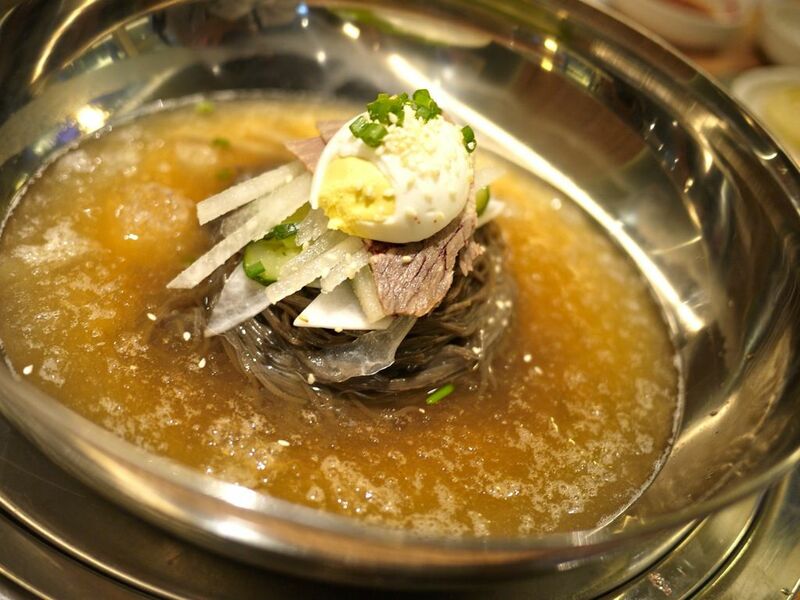 This is a traditional Korean soybean paste stew with beef ($16). 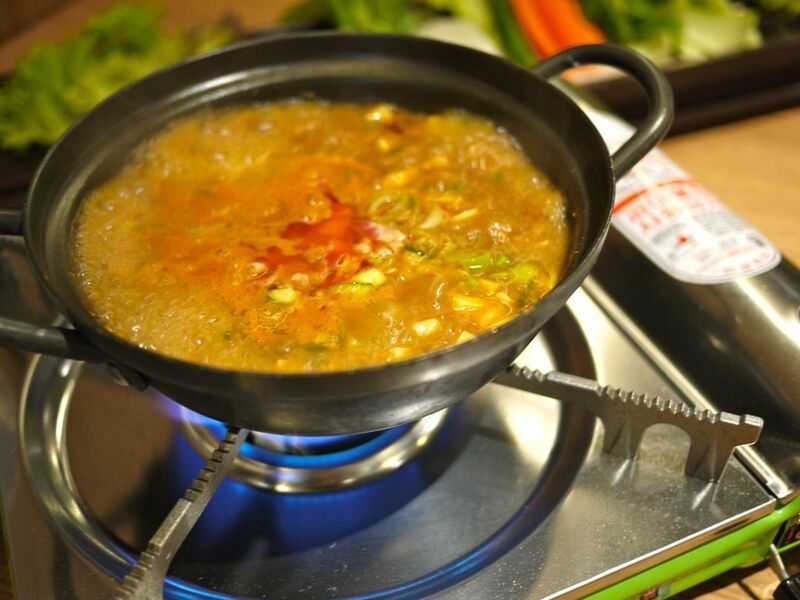 The stew is reduced over the table top stove and then made into a bimbimbap after mixing the rice and vegetables in. The result? 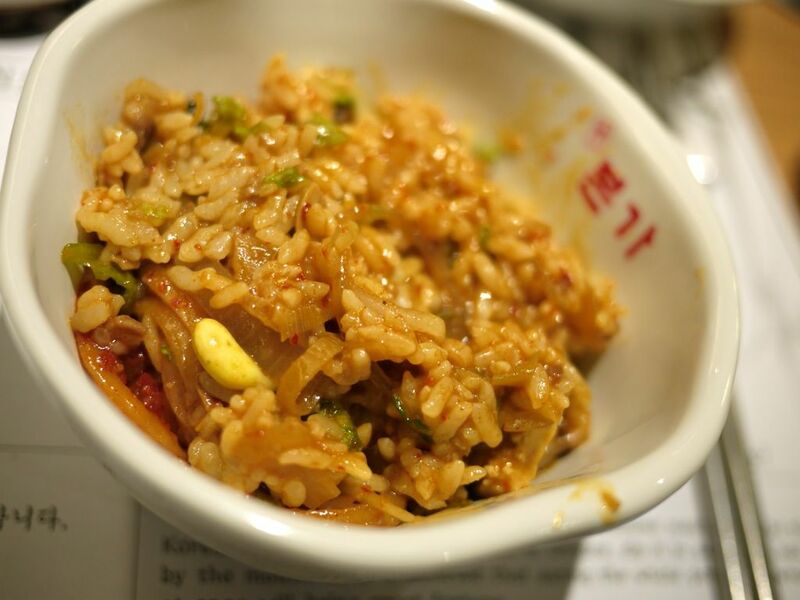 A rich and flavorful bowl of rice a la mui fan style. Love the spicy kick in this one. 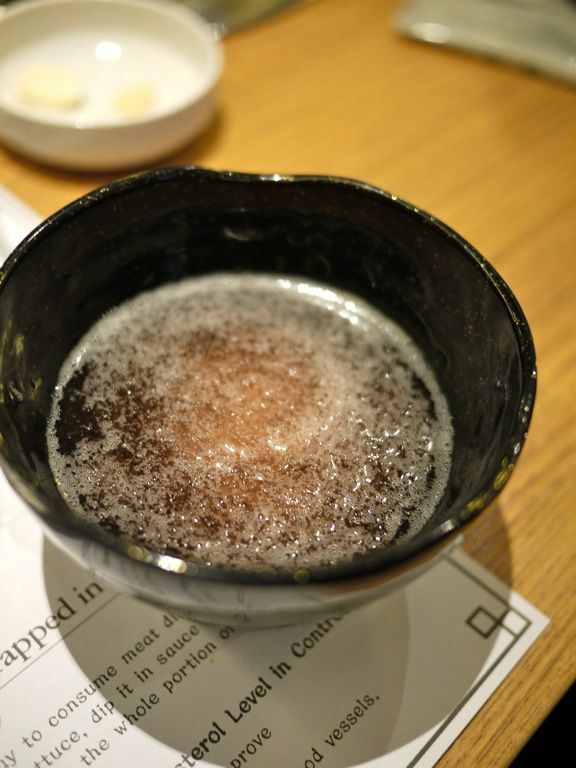 To end it all, the Omija (five flavored tea) is served to all guests after their meal to cleanse their palate. This tea supposedly has cleansing and beautifying properties. I took home a pitcher. Kidding. I enjoyed my Bornga experience very much. 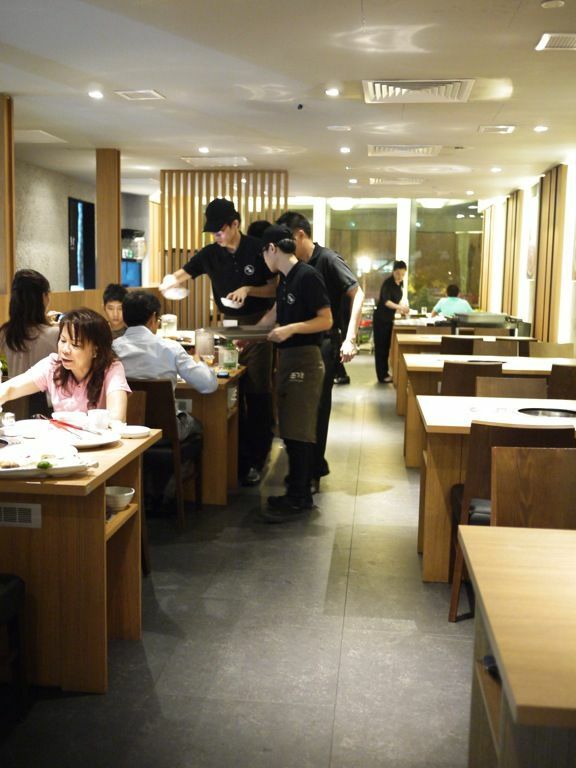 The environment and ambience is very comfortable for a meal with family and friends. Noted that there isn't much smokiness in the indoor area. I would say sit outdoors if the weather is cool. Bornga will also be opening a second outlet in Vivo City some time this year so keep a look out. 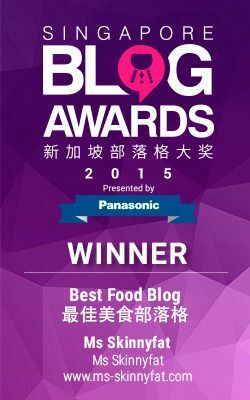 Thanks to FoodNews and Bornga for this invitation.